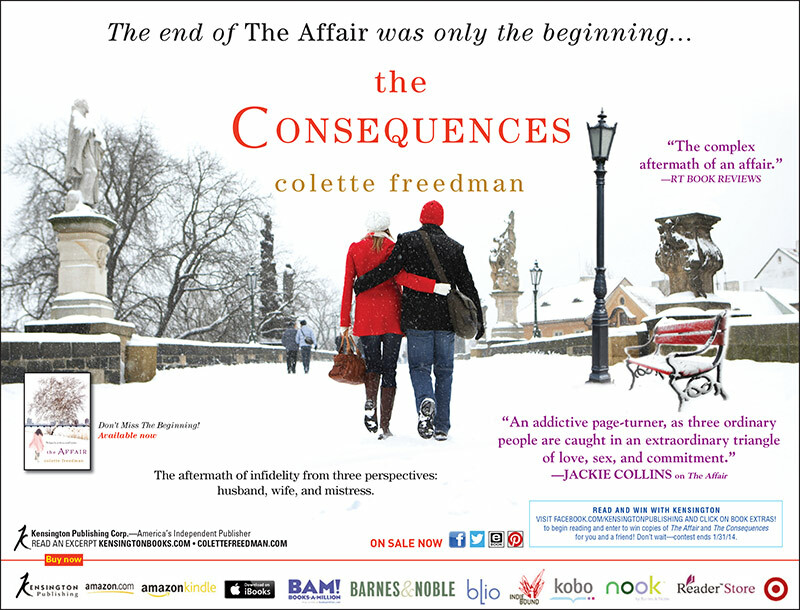 The Consequences - Colette Freedman is a top Hollywood Script Doctor who has also ghost written several novels. Auggie Talk – an excerpt (click on title to read more) I started writing plays, because I wanted to give myself work as an actress. I wasn’t getting leading roles in other people’s plays, so I figured if I wrote my own plays, I could be the star of them. Or at least the scene stealing comic relief. The first play I ever wrote was in fifth grade, when I took a character from every television show that was on the air and invited them to a Jewish Thanksgiving. Now, Jewish Thanksgivings are exactly the same as every other denominational Thanksgiving … though I would argue with more food and better songs. But because it was theatrical, I had Archie Bunker saying “Oye” and one of Charlie’s Angel’s doing the brachot over the kosher turkey while Love Boat’s Captain Stubing did the after dinner Birkas Hamazon. The play was called “Three Network’s Jewish Thanksgiving” (yes, that was back when there were only three networks) and though I no longer even have a copy, I do remember the feeling I got, sitting to on side of the stage (as Jan Brady) and watching an audience of rapt ten year olds. I’ve stood on many stages over the years, sat in countless audiences, but, that first audience is the one that sticks in my memory. 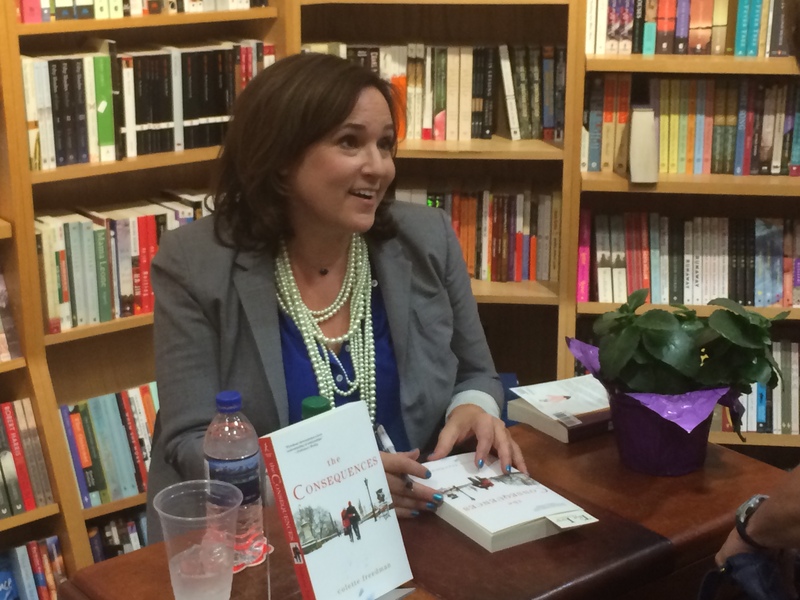 My journey from fifth grade playwright to novelist wasn’t direct. (No writer’s life follows a simple trajectory.) I went to school, I traveled, I experienced life. And throughout it all, I kept writing, always writing, even though that writing was sometimes in the margins and around the edges. Manic Readers – an excerpt (click on title to read more) How can one rebuilt a life when one discovers that everything they believed in and trusted is based on a foundation of lies? When we are children, we often act impulsively, rarely knowing or caring about the consequences of our actions. We are forgiven because we are young, immature and not well versed in propriety and social rules. We also have parents, teachers and mentors to guide, instruct, educate and reprimand us if we “mess up.” But who guides, instructs and reprimands us when we mess up as adults? Grownups no longer have the justification of childhood ignorance to protect them from the consequence of their actions. Of course, they have family, friends and colleagues to talk to, but ultimately, everyone is responsible for their own actions. In The Consequences, we see a man who is having trouble accepting that responsibility. Like most cheaters, he wants to have his cake and eat it too. And while we can forgive him for having the affair and empathize with his contrition, we cannot forgive his continued lies, both to the women whom he loves and, of course, to himself. Kindle Obsessed – an excerpt (click on title to read more) It’s daunting to write a sequel because sometimes you are setting yourself up to fail. Luckily, with The Consequences it is more of a continuation than a sequel as it starts, literally, ten minutes after The Affair leaves off. The breathing space between the two novels gives Robert, the husband, just enough time to leave the house where he witnessed the confrontation between his wife and his mistress, defrost the windshield, turn on the car heater and drive off. Miss Ivy’s Book Nook – an excerpt (click on title to read more) The love triangle is as old as humanity. It has been seen in history, Henry VIII and assorted wives and mistresses, royalty (Prince Charles, Princess Diana and Camilla Parker Bowles), film (François Truffaut’s 1962 Jules et Jim & the more recent Savages) and of course, life. Everyone knows someone who has had or is involved in an affair. And of course we are always quick to judge, to point fingers and ascribe guilt. But our responses are influenced by relationships, friendships and family ties, and the truth gets lost in all of that baggage. But, in an affair, there are no simple answers, no easy truth. Book Reviews & More by Kathy – an excerpt (click on title to read more) As with The Affair, The Consequences is told from each of the key participants’ perspectives of the same events and time period. Again, I found this approach unique and compelling and I appreciated the insight into each of the characters. My respect for Stephanie and Kathy grew and while I felt sympathy for Robert’s unexpected loss, on the whole, I eventually lost what respect I had for him. Words With Writers an excerpt (click on title to read more) Writing is really rewriting. The first thing you write is never right. (Try saying that three times quickly.) When I write, I generally have the characters and a broad outline of the story in mind. I tend to write quickly and just get it down. I would never show anyone the first draft as that is the backbone of the piece. Once a first draft is complete, I spend most of my time carving out the characters, finessing the dialogue and adding tension to the structure. And of course, it is true to say that a book is never really complete. You just pick a time and stop—otherwise you will spend the rest of your life fiddling with it. Chicklit Plus an excerpt (click on title to read more) When I was a child, I went to the library every Saturday and filled up on books for the week. I’d devour ten in a week and be excited to return for more. My early love of reading gave me a love of writing. Not only did I love Judy Blume’s flawed heroines, the ordeals of the Box Car children, the adventures of the sisters in Ballet Shoes and the struggles of All of a Kind of a Family, I wanted to be able to write stories like Blume, Sydney Taylor, Noel Streatfeild and Gertrude Chandler Warner. And I have yet to find a writer who did not start out as a reader. Confessions of a Reader an excerpt (click on title to read more) Twitter, Facebook, Pinterest and Instagram, have made the world very small, very immediate and very intimate. They are wonderful tools for bringing people together and allowing them to keep in touch. And while they are often seen as necessary tools for writers, I don’t just use them to self-promote: they are fabulous methods of researching and discovering. I also find it fascinating how many ‘likes’ people get on posts. The cute factor always scores highly: babies and puppies tend to get the most likes. However, I had a wonderfully odd experience recently. I posted an advertisement on Facebook for The Consequences in US Weekly. The ad was placed to the right of a two page Kardashian spread. My ‘likes’ went crazy. Briefly, I even became an honorary Kardashian: Kim, Khloe, Kourtney and now … Kolette. Chicklit Club an excerpt (click on title to read more) What makes women’s friendships so intimate? I can only speak from my own experience, but I think it’s because we tend to talk through our problems. It’s the metaphor of the man refusing to ask for directions when he is lost. If a woman is lost, even metaphorically, she asks her friends for advice … she asks for directions. I am constantly asking for directions and I would be lost, literally and figuratively, without my girlfriends. Love Words and Books an excerpt (click on title to read more) To watch another woman kiss your husband, well, there’s nothing like it. I almost would have preferred to watch them f*ck. But that kiss. That was the betrayal. I wanted to kill them both, but, like a well trained Daughter of the Revolution, I waited until they went inside and I drove home and made myself a gin and tonic. Two gin and tonics…And I wept. Deep in the Heart of Romance an excerpt (click on title to read more) What are your favorite hero traits that you cannot resist? I cannot resist a hero who is intrepid, generous, compassionate, loyal and kind. I just saw Frozen and the dual heroines have these traits as well. What I love about good heroic traits is that they are not gender specific. C.B.Y. Book Club an excerpt (click on title to read more) What is the simple most important thing needed for a relationship to last? Honesty. I look at my parents’ relationship which is stronger now than ever and they’ve been married for four decades. They fight, they argue, but there is no doubt that they love one another. And they are scrupulously honest with one another. I am convinced that is how the relationship has lasted the test of time. Elizabeth Mckenna an excerpt (click on title to read more) What is your favorite scene in a book? Why? The last scene in Gabriel Garcia Marquez’s 100 Years of Solitude. I’ve never seen an entire book summated so brilliantly as this. Usually, I enjoy the journey of reading a book. In this case, it was about the destination. For the Passion of Romance an excerpt (click on title to read more) -In your own thoughts do you believe that love is capable of enduring the hardships that are often credited by life? Absolutely. Love, in my humble opinion, is the strongest of all emotions. If you have love you can and will survive anything. It will be incredibly challenging and often painful, but you can endure despite overwhelming obstacles and hardships. And you can come out stronger.